Welcome to our first blog for the year 2014 ! 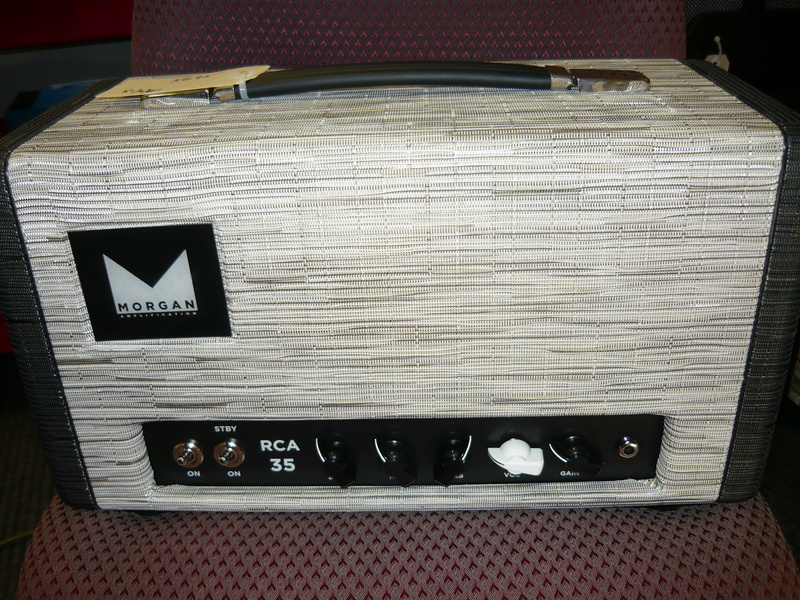 Another Morgan amp came to our Wyoming workshop for repairs a while back – this time the RCA35 model. 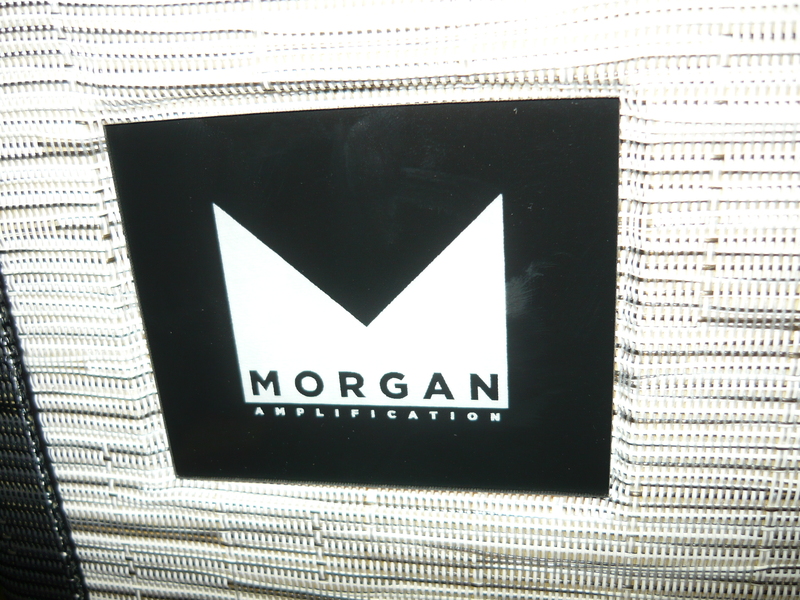 We previously discussed repairs to the Morgan SW50 back in January 2013. The RCA35 is voiced quite differently to the SW50, and is intended to be a ‘clean headroom’ amp, according to the Morgan website. 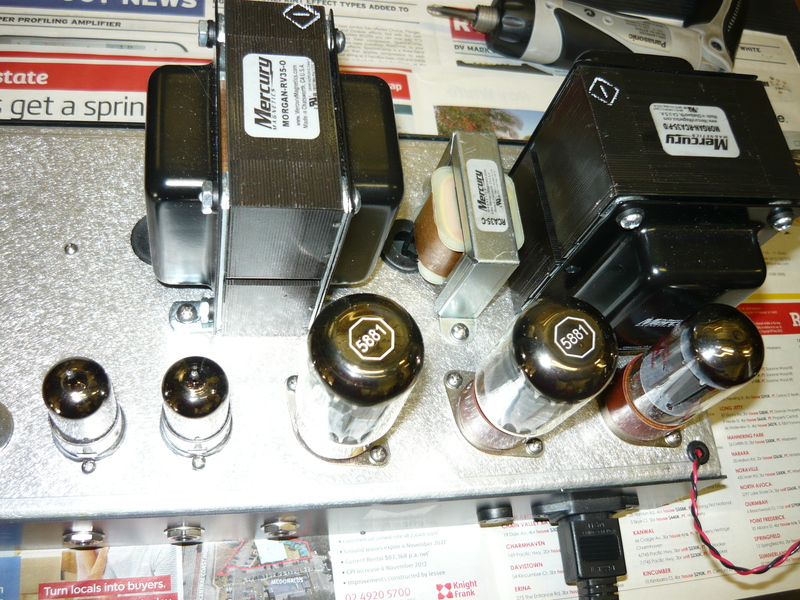 A pair of cathode-biased 5881 output valves delivers 30 watts output @ the onset of clipping. Our good customer, Josh, had purchased this amp about 6 months previously and advised us he was getting some very strange sounds, almost like an octave-fuzz pedal. At our first attempt to diagnose this, the RCA35 behaved perfectly so we were none the wiser. This situation happens sometimes ! After Josh got the amp back home again, of course it played up immediately, so he recorded the sounds on his ‘phone & sent them to us, and indeed the amp sounded like there was an octave fuzz pedal happening. Back in the workshop, I strongly suspected that this degree of amp instability must surely be down to a faulty electrolytic capacitor (or capacitors) in the amp’s high voltage power supply. Josh was preparing to head off for a short tour in central western New South Wales with a band, so we couldn’t take the risk of leaving an intermittent fault in the amp. 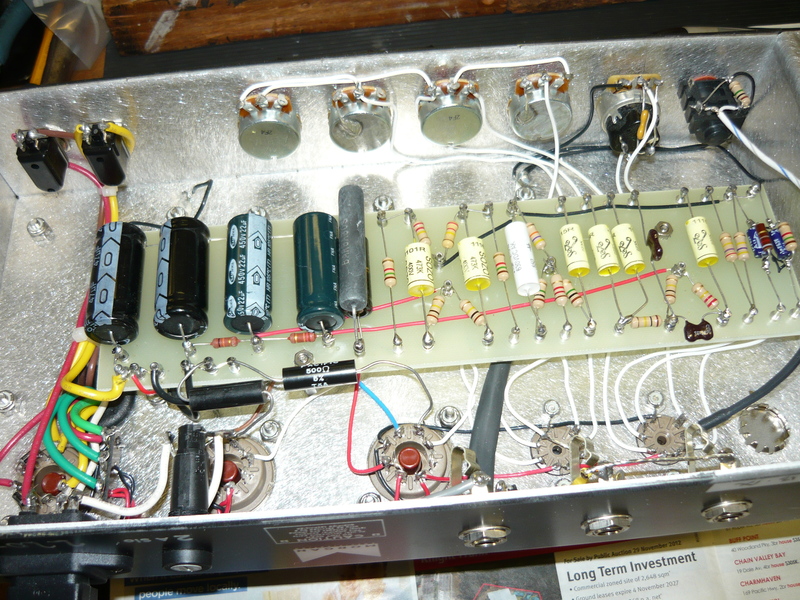 Therefore we took the decision to replace all four HV (high voltage) power supply caps, plus the cathode bypass cap for the output valves, just to be sure. 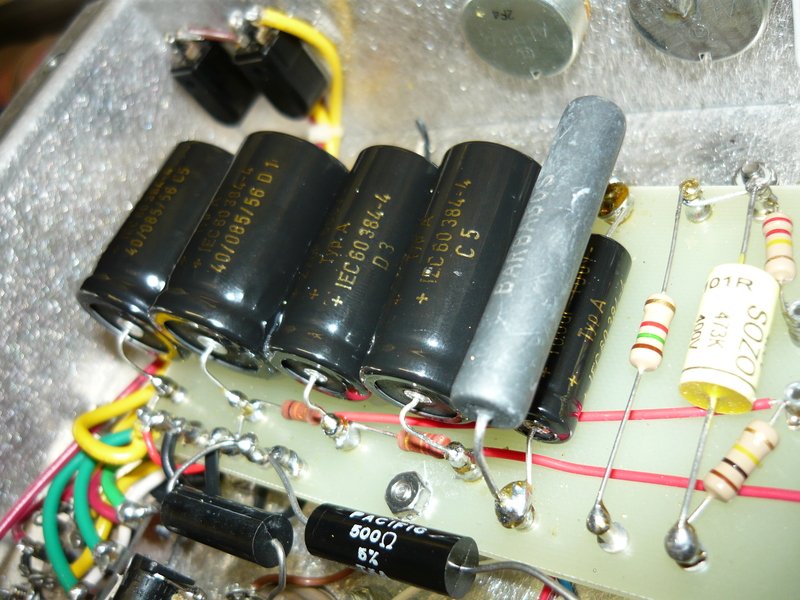 You can see from the photos that the original capacitors were of standard consumer electronics quality, and of recent production. There were no tell tale signs of leakage or faulty manufacture. 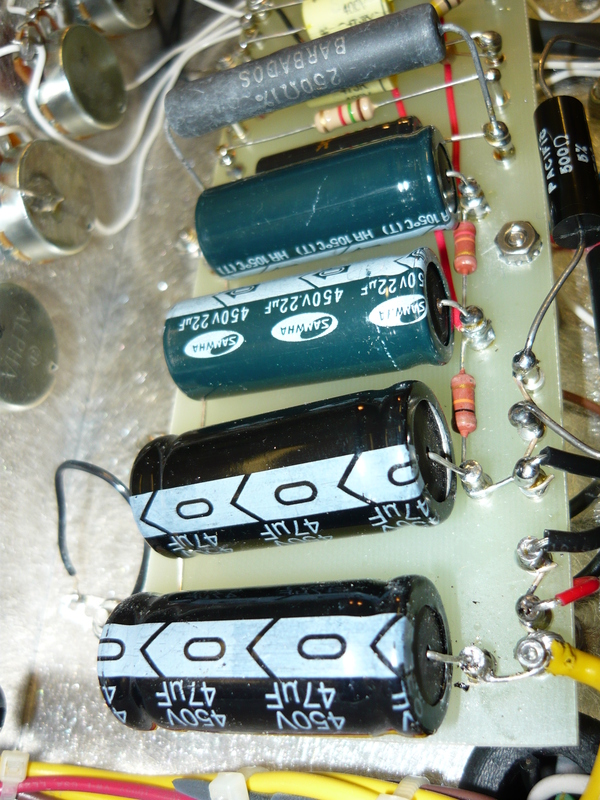 We installed a set of those very fine F&T capacitors, bedded down in some silicone (neutral cure) for stability. Sprague ‘Atom’ capacitors would also be an ideal choice although their larger physical size sometimes limits their application in service work. The list of capacitors reads as follows: 2 x 30uF/500V, 2 x 22uF/500V plus 1 x 100uF/100V. We also tightened a loose fuseholder and changed the fuse size from 2 amp to 1 amp as in Australia our mains power is obviously 240V (sometimes higher), and labelled the rear panel accordingly. The manufacturer and their local distributor really should have taken care of that particular issue. With the high voltage supply reading +430V DC, we measured 15.6V into 8 ohms = 30 watts @ the onset of clipping. 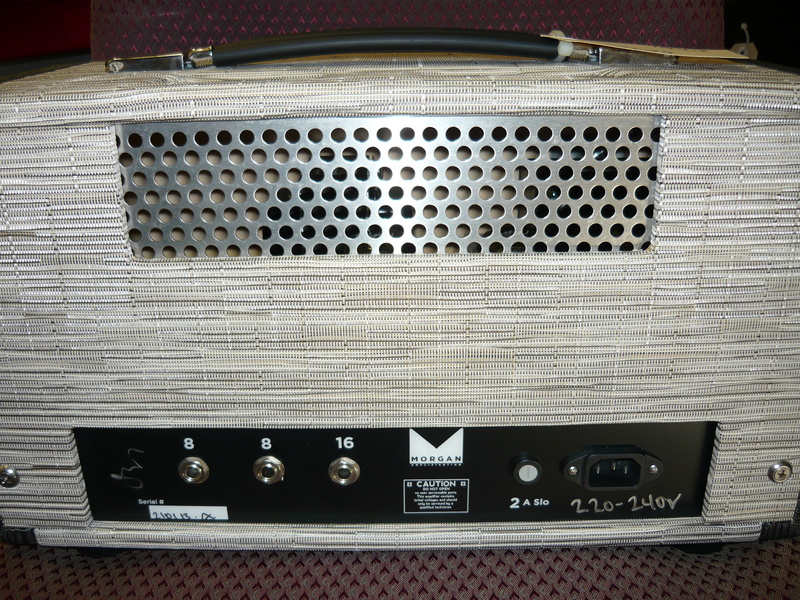 We were pleased to hear that Josh got through his tour OK and there were no further problems with this amp ! 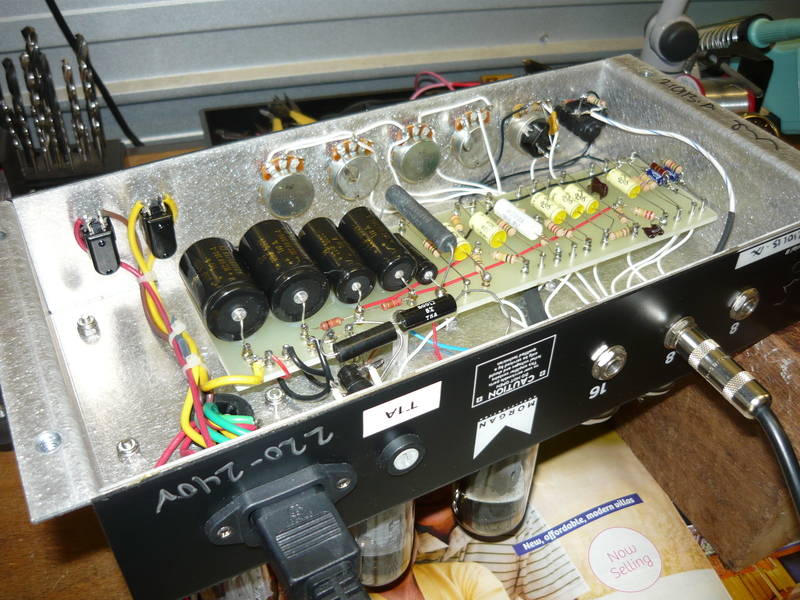 This entry was posted on January 27, 2014 at 8:20 am and is filed under Amp Repair, Amps. You can follow any responses to this entry through the RSS 2.0 feed. You can leave a response, or trackback from your own site. Hi Ivan, the Morgan is still working perfectly. Thanks for all your help. many thanks Josh – pleased to hear that ! IR.